Grape Vine Basket in Cranberry Opalescent with Vaseline, Bargain Shack offers Boyd Glass, Mosser Glass, L.G. Wright, and Contemporary Collectible Glass including Vaseline Glass - J.B. Scottie Dogs, Pooche, Animal Covered Nests, Toothpick Holders, Salts, Glass Animal Figurines, Clowns, Dolls, Slippers, Vehicles, and More! This beautiful Grape Vine Ruffled Basket is truly a work of art. The Cranberry basket sparkles with gold glitter encased inside the glass and is topped by a beautiful opalescent ruffle. 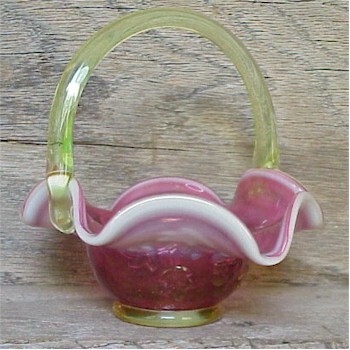 The handle is pure vaseline glass and was hand applied to the basket. The Gibson Glass tradition of quality craftsmanship shows on this 5 inch tall basket and the bottom is stamped Gibson 2004.